In 1965, the Los Angeles Contemporary Museum of Art first opened its doors on Wilshire Boulevard. Before LACMA, Los Angeles lacked any semblance of an alternative art hub. It was this absence, however, that made way for a new generation of artists who embraced the city as unique platform from which they could indulge in an ultimate “freedom from an established way of seeing, making, and marketing art,” as written by Hunter Drohojowsak-Philip in Rebels in Paradise. Serving as a launching point for the show, “No. 13” (1961) by John McLaughlin reads like a prologue. Self-taught and inspired in part by his travels in Asia, he recognized geometrical forms, primarily the rectangle, as a matrix for contemplation. 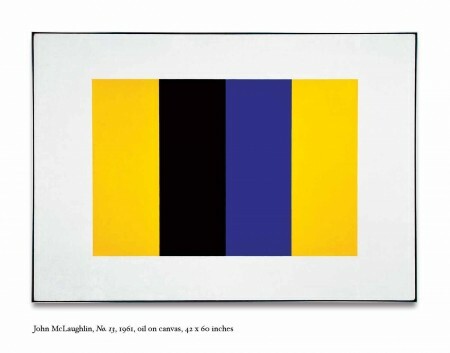 Ahead of his time, McLaughlin exerted great influence and was “a crucial West Coast predecessor for Light and Space artists,” as expressed by Michael Duncan for Art in America. Other Southland artists featured in this survey either studied at Chouinard Art Institute or had been a part of the “gang” at Ferus Gallery during the late 1950’s and early 60’s. Both institutions have deep roots in the city’s developing art scene and proved essential to the establishment of Los Angeles as a contemporary center of influence. The Los Angeles Avant-Garde: 1950’s – Present also features one of Larry Bell’s boxes. An alumnus of Chouniard who also showed with Ferus, Bell remains an influential figure to the Light and Space movement. When Ferus featured his treated mirrored boxes in 1962, his reputation took a positive turn as did his fascination with light and perception. Pliant materials such as fiberglass appealed to Bell, but he soon began working with glass, mirrors, and chrome because he found that he could alter the way light interfaced with their spectral surfaces. Situated in the center of the gallery, “Series II Cube” (1985) functions as an apt conduit for the show, reflecting the works of his contemporaries. Also on view are works by the first artist to ever show with Ferus: Wallace Berman, a crucial figure in the history of postwar California art. Another Chouinard graduate, Berman identified with the Beat culture and looked to found and discarded objects to create art. 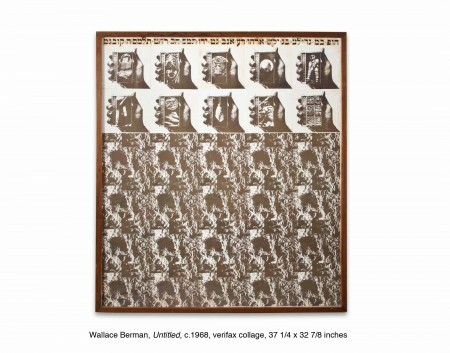 Best known for his verifax collages, which include reproductions of newspaper and magazine imagery (created before the advent of the copy machine), Berman remains recognized as the father of assemblage art. He is best known for his verifax collages, which include reproductions of newspaper and magazine imagery (created before the advent of the copy machine). 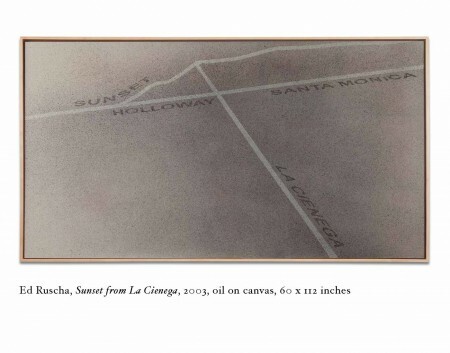 Ed Ruscha, one of Ferus’ most prominent living artists, is represented by two of his word-based paintings: “Vaseline” (1967) and “Sunset from La Cienega” (2003). Each reflects a different period in Ruscha’s career yet demonstrates his ongoing interest in typography, which was a byproduct of his education at Chouinard. Initially, critics struggled to define Ruscha’s unique style, yet his clever witticisms and language play are what ultimately linked him to Pop. Longtime friend of Ruscha, Joe Goode also studied at Chouinard. Under the tutelage of Robert Irwin, he developed the sense to work without constraint and thus produced his monochromatic milk bottle paintings that put him on the map as a pioneer of Pop. 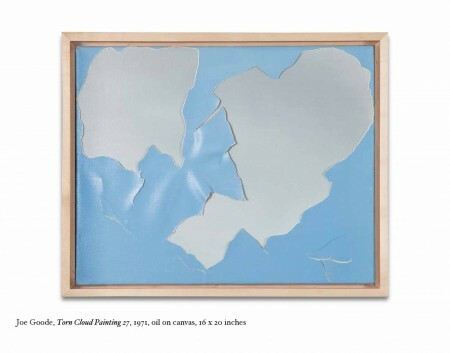 Goode also is known for his Torn Cloud paintings, two of which appear in this survey. “Torn Cloud Painting 27” (1971) is exemplary of his handling of materials that reverses the conventional figure/ground relationship. Five photographs by Charles Brittin, who saw himself as a documentarian more than a fine artist, extend the context of the unique environment of which these artists were a part. It was a chance meeting with Berman in the 1950’s that afforded him entry into the Ferus camp. Home to a number of the gallery’s “gang” members, Venice Beach was one of Brittin’s early subjects. While his photographs of the area’s pre-gentrified landscape provide an archive of the now affluent neighborhood, once blighted by oil derricks and decay, they also provide an insider’s view of LA’s early art scene and Beat culture. Llyn Foulkes is another influential artist of the era whose work also appears in this seminal exhibition. The relationships he formed at Chouinard are what led to his relationship with Ferus. His inclination to work alone and remain consistently inconsistent, however, proved too radical for even the “gang.” Despite Foulkes’ tendency to shift gears after meeting any semblance of critical success, his disdain for gallery culture is what ultimately pushed him to produce such an innovative oeuvre over his career. Lita Albuquerque is the youngest artist to appear in this exhibition. Based in Los Angeles, she emerged on the California art scene as part of the Light and Space movement. She initially gained attention for her ephemeral pigment pieces created for desert sites during the 1970s and has since continued to push the boundaries within this genre by questioning our place in the enormity of infinite space and eternal time throughout her practice. While there has always been a tense relationship between those who inhabit Los Angeles and those who live in San Francisco, many artists from the Bay Area have been integral to the establishment of a definitive West Coast art scene. Richard Diebenkorn, for example, is regarded as one of the most gifted painters to come out of the Bay Area Figurative Movement. Although only one untitled work appears in this show, it reminds us that his return to figurative painting was a radical act that helped initiate the end of mainstream painting solely in the Abstract Expressionist style. Ken Johnson for The New York Times described Bruce Conner as “a restlessly inventive and unpredictable artist who avoided typecasting and irascibly resisted the demands of the commercial gallery system.” What initially earned him notoriety were his assemblages, produced during the 1950’s and 60’s. Erotically charged and evocative of San Francisco’s Victorian past, Conner’s avant-garde works from this period include an array of women’s stockings, broken dolls, fur, photographs, and paint, and other found objects. Among his works on view is “Untitled (Pearl Necklace)” (1958), one of the artist’s mixed media assemblages that interweaves paint, silk, and photo collage with a string of pearls. Another influence upon the late 20th century Bay Area art scene was painter and collage artist Jess Collins (known by the mononym Jess). According to Harry Parker, former director of the Fine Arts Museums of San Francisco, Jess was “the essential San Francisco artist. His political views and his quirky artistic style, his association with the poetry scene, his advocacy of gay rights — all the issues that came into his work were so representative of the San Francisco perspective.” Often, the artist touched upon themes concerning chemistry, alchemy, and the occult, all of which appear in his untitled collages that complete this exhibition. In 2011, the Getty Museum gave us Pacific Standard Time. A spectacle of sorts, the event was the first to provide an historical record of key postwar artists who came out of the Southland. While this survey reiterates how Los Angeles’ embryonic landscape has helped shape the output of various artists, The West Coast Avant-Garde: 1950’s – Present also reveals how integral the renegade yet celebratory spirit of a courageous group helped to establish movements such as Pop, Light and Space, Minimalism, Conceptualism, assemblage, and Hard-edge. The West Coast Avant-Garde: 1950’s – Present opened on July 17 and will remain on view through September 4 at Kohn Gallery, located at 1227 North Highland Avenue in Los Angeles.